Not stuck at home, but stuck at work today — the roads are so nasty that I'm skipping my usual trek home for lunch to walk the dogs and snap outfit pics. So here's a little roundup from the interwebs instead. 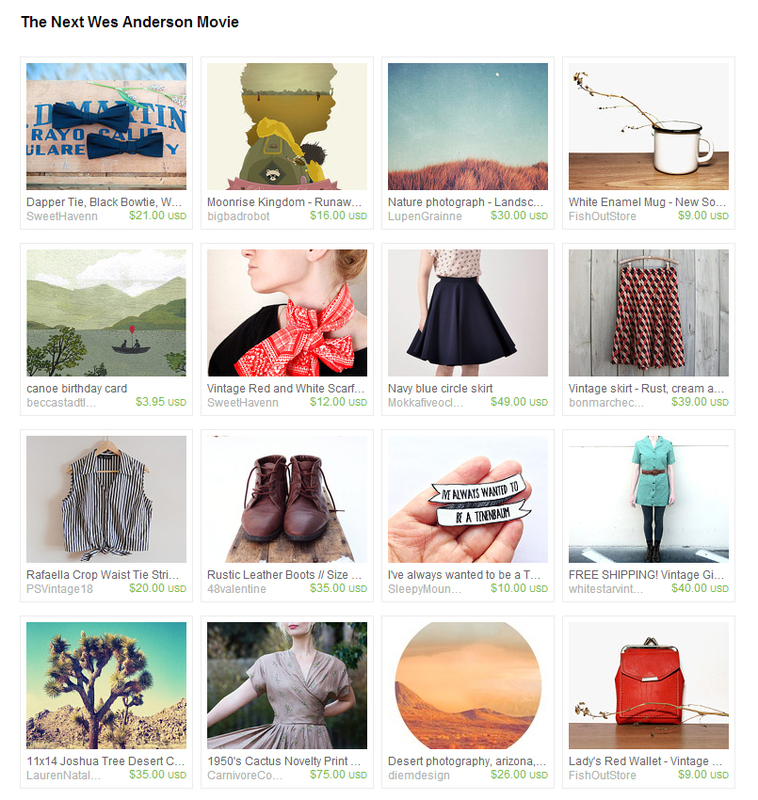 Super stoked to have my Op Art print skirt included in this Wes Anderson tribute treasury! Confession time: I haven't seen a new movie in, like, three years (not even kidding). But back when I had a life, I used to like his stuff. What's your favorite Wes Anderson film? Or do you think he's a pretentious wanker? I have one teeny tiny houseplant right now: a cute little mimic plant. But I want MORE SUCCULENTS! I am really dying to try putting together a big combination planter like this one. Never mind that I have no idea where I would put it ... I know these plants are super Pinterest-trendy but I don't care, I really can't get enough of succulents. My husband planted a ton of succulents on a stump at our old house and I miss them all so much, it's ridiculous. OK, now the word "succulent" has lost all meaning. Succulent succulent succulent. Don't you hate it when that happens? Leave a comment on the original post.